The primary legacy of the twentieth century is war. The rich industrial nations of the world developed destructive technology and used it in ways that came close to destroying the world. The century included two global conflicts, World War I and World War II, and climaxed with the invention of a weapon that killed hundreds of thousands of people, and eventually had the potential to destroy the humanity. We have come to accept the recklessness of World War. Today there are organizations such as the United Nations to help keep peace, and instantaneous communication allows people to understand what is happening throughout the world. We are unlikely to experience a global conflict in our time, but it is important to understand how close the world came to ruin, and how the forces of the past century influence our lives. It is impossible to describe a topic as vast as the World Wars in a few short pages. The villains are more monstrous, the heroes more courageous, and the victims more tormented than most imaginations allow. Steven Spielberg’s films, Schindler’s List and Saving Private Ryan, are graphic and inappropriate for younger students, but they help demonstrate the evil, the daring, and the grief of global warfare. a section on World War I and World War II. The United States has been personified by Uncle Sam for almost two hundred years. This 1916 poster by J.W. 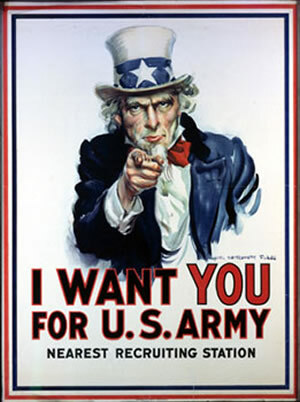 Flagg was used to recruit soldiers for World War I and World War II. Raising the Flag on Iwo Jima depicts five United States Marines and a United States Navy corpsman during the Battle of Iwo Jima on February 23, 1945. 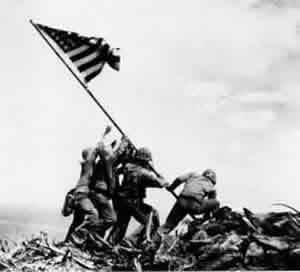 The photograph became one of the iconic images of World War II.